When I do rug cleaning courses, invariably a student will say, “Just tell me how to clean it. Why do I need to know what the rug is?” Unfortunately, rug identification is not really understood by many cleaners. The ability to correctly identify commonly encountered rugs is a component of a cleaner’s product knowledge that is essential to a successful business. You do not have to know the difference between a Bibikabad and a Bijar to be a great rug cleaner, but basic rug ID skills distinguish a rug cleaner from the true professional. So what is product knowledge? It is the rug’s fiber content; the construction (machine vs. hand-made, hand-knotted, flat weave, hand-tufted or a specialty type rug); identifying problem rugs in the pre-cleaning inspection; and the country of origin. And why rug identification? It’s fun, and increases in difficulty with each level of learning, improves your professional image and helps identify potential cleaning problems. A superior product knowledge delivers better customer service and develops trust with your customers, which can lead to additional sales. When you are talking to a customer and mention in passing what a great Bijar she owns – the cost of cleaning is no longer the issue. You are the expert who can be trusted with her rug. Also, knowing which rugs have inherent problems (like the new Tabriz production, which are prone to dye bleeding) will allow you to address these issues with the customer during the pre-cleaning inspection and choose the appropriate cleaning method. What are the reasons many cleaners do not have rug product knowledge? It is hard at first; there’s a fear of failure; it requires extra effort; there are few instructors are qualified to teach the subject; and the big investment for the instructors to acquire rugs for class. However, training classes and teaching books do exist to help you gain this knowledge. 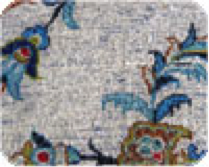 The next step on our “Road Map To Rug Identification” is to determine if it is hand-knotted or a specialty rug. 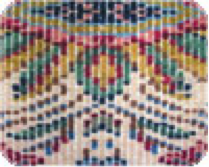 A hand-knotted rug will clearly show the pattern on the back – without continuous visible warp yarns and you may see the wefts which, in Image 2, are purple. Image 3 is of a 1960s to 1970s Kashan. An on-location cleaner brought this to a rug plant for correction because the wefts bled during cleaning. Knowing this era of Kashan rugs have the potential for the wefts to bleed (which does not show up on a dye bleed test) would have saved a lot of grief. The rug cleaning specialist was able to remove the blue with a little “magic,” avoiding having to purchase the customer’s rug, and so the day was saved. 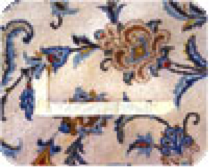 Determine what type of hand-knotted rug you are about to clean will require doing a technical analysis: what type of knot was used; the fiber content, color and number of the warp and wefts; the design to some extent, (but it is not that reliable in coming to the final conclusion); how the ends and sides of the rug are finished; and the size of the rug is also helpful as some rugs are generally made in larger sizes, such as Heriz. With good resource materials and knowledgeable instructors, you can learn this challenging but fun topic and become the rug expert for your customers and prevent potential problems like those with the Kashan.